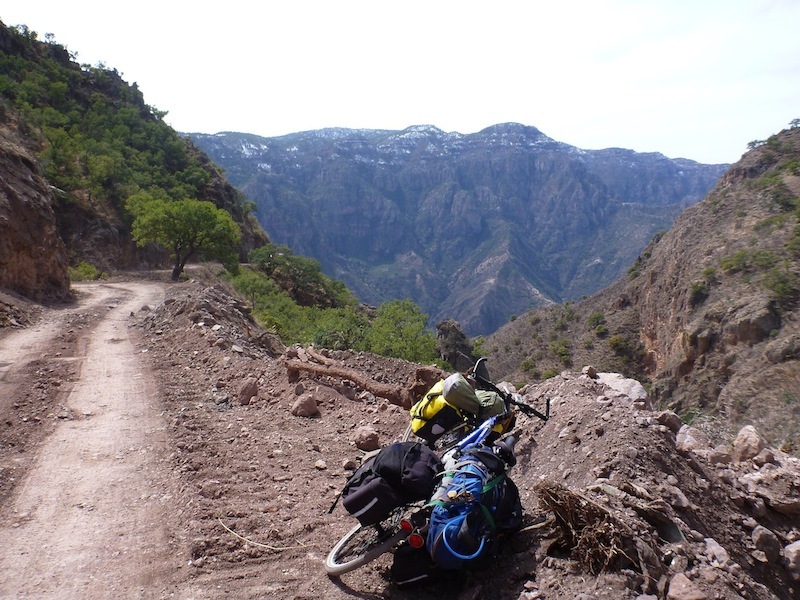 I spent over two weeks exploring the Copper canyon by bicycle and by foot. 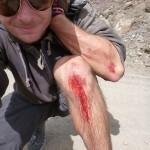 I had my first crash, and there was blood. I traded a snickers bar for a huge bag of weed and then later gave it all away. I took Tony on the most difficult road that man has ever attempted to take a touring bike on, and we both survived. I had a chat with a 15 year old and didn’t notice the machine gun on his lap. I spent a week hiking on my own and drank dubious water. I shared a fire with an old Tarahumara guy one night and he talked about the virtues of Jesus while I talked about the virtues of socks. I woke up one morning to a world covered in snow and the next to a 35C/95F sun (not a drop of water in sight). I made tortillas by campfire and then I made more. And that was all before the race. 20 km down into the town. Urique though, was bustling. 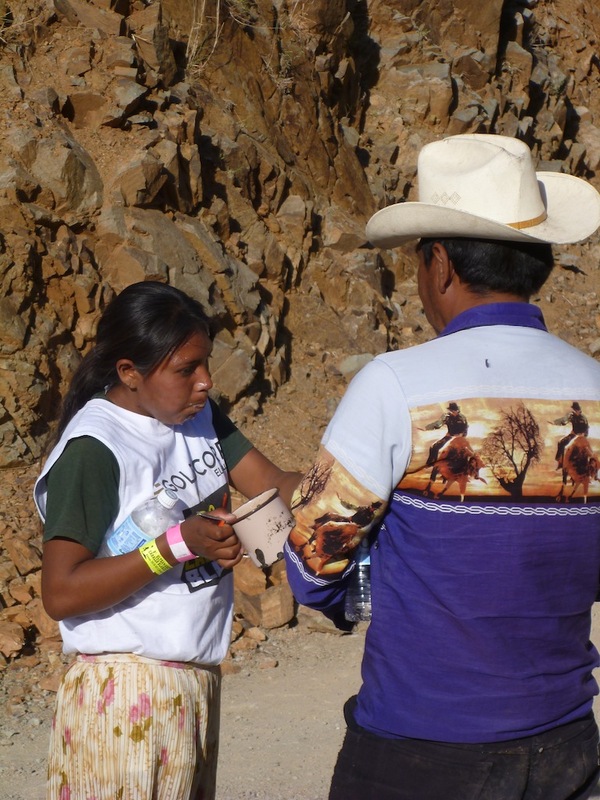 A couple hundred foreigners had arrived in this tiny unassuming little desert town and more and more Tarahumara were arriving every hour on foot to partake in the 8th annual Ultramarathon Caballo Blanco. The atmosphere was festive and the excitement was contagious. How often do you get a chance to see ancient wisdom race against modern technology? 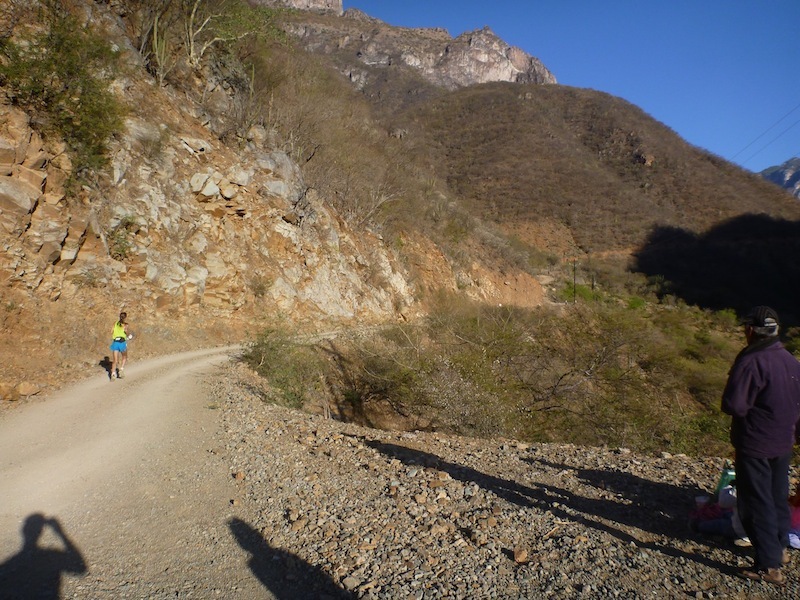 The Ultramarathon Caballo Blanco is an 80km footrace. For the distance impaired: 80km is a bloody long ways! Hell, at twice the length of a marathon, 80km is a tough day on the bike! This race is no Berlin Marathon though; it is run on tough rocky trails in extreme heat and features three difficult climbs. The course is laid out such that it passes through town four times, including the start and finish. This is convenient for the spectators – as it allows them to see the runners many times throughout the race – and it is convenient for the runners – as they can leave their food bags and support crew in town and stock up on fuel/love each time they pass through. The fact that well trained athletes can run 80 km on difficult hilly trails in intense 35C heat is, in a word: incredible. To see hundreds of average ordinary Tarahumara going the distance to win the finishing prize of 150kg of corn? That’s humbling. The race is so long that it takes almost a marathon effort just to watch the whole thing (but don’t mention this to the runners… they won’t empathise)! The fastest runners will take around 7 hours to finish but the slowest can take up to twice as long! They would take even longer, but there is an official cutoff at the 65km mark. If you haven’t reached 65 km before 10 hours, your time is not officially recorded and you don’t get your corn. This is a safety measure to keep people from killing themselves out on the trail after dark (sun sets at 6:30). So as a spectator who has been up since 5 AM, it takes more than just a vague interest to keep you cheering in runners 14 hours later. At 5:00 in the morning the next day I woke up to the sound of runners getting ready. I had camped at EntreAmigos, a nice little hotel/hostel/campground a short walk out of town run by a very kind American expat named Keith, and most of the foreign runners seemed to be staying there. The mood in the morning as they ate breakfast was tense and quiet. 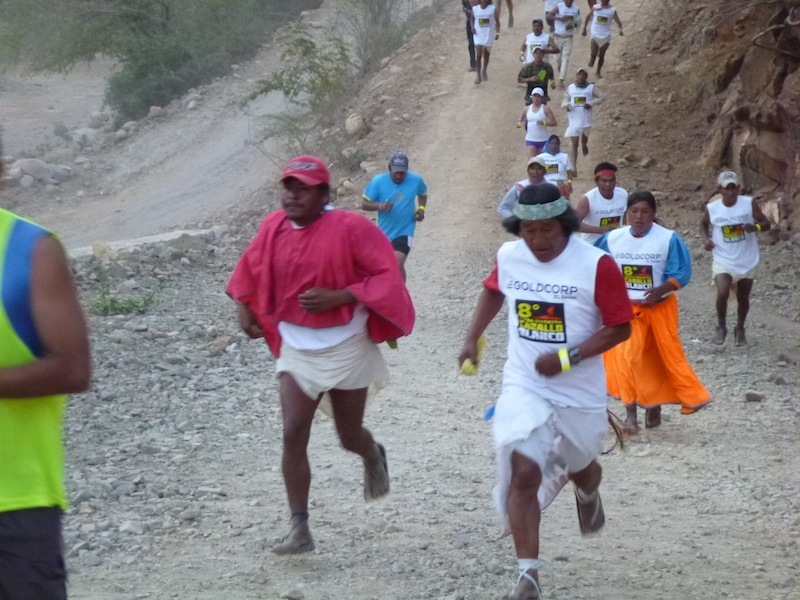 By 6:30 though, 500 people were lined up on the starting line in town including 82 foreigners from 15 countries, and over 400 Tarahumara. On the one side of the equation the foreigners were mostly wearing $200 shoes, eating powerbars, gels, and salt tablets while sucking down Gatorade. The day before the race they had made sure to do nothing but laze around. 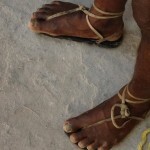 On the other side of the equation, the Tarahumara wore homemade huaraches (sandals made from old car tires), were eating pinole (toasted corn flour mixed with water), papayas and bananas, and drinking water mixed with still more pinole. The day before the race they had hiked in from their surrounding towns and villages. In the end, both techniques proved to be successful. The Czech runner sets a blistering pace 15km in. When the race started, I was was well ahead of the pack, riding on the back of an ATV being driven very quickly by Uri, a photographer from Mexico City that I had just met at the starting line. Riding with him I was lucky enough to see the race from a few different vantage points before settling down in town to wait for the finishers. I spent my time in town mingling with the girlfriends and friends of the runners, cheering on the handful of runners I had gotten to know before the race, and – once they started coming in – talking to the runners who had just run 80km and still had enough energy to have a beer and cheer on their mates. I met the stars of Born to Run, including Caballo Blanco, Barefoot Ted and Arnulfo Quimare as well as other inspiring runners such as Kelly Cronin, The Coury Brothers, and Mexican olympian and two time winner of the NYC marathon, German Silva. I witnessed amazing feats of endurance and old ladies in bulky colorful dresses running for corn. 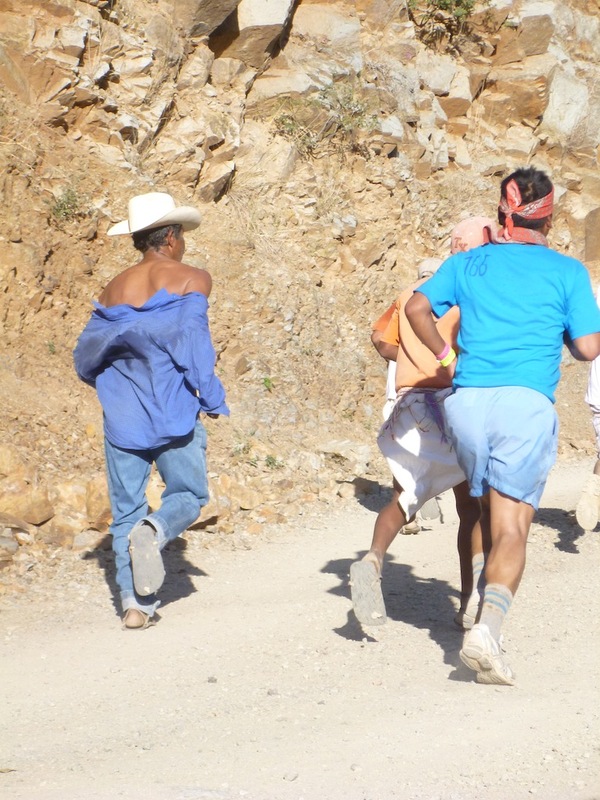 I found a new hero: an old man in jeans, slippers, a blue collar work shirt, and a cowboy hat crossing the line after running 80km through the intense heat. So many amazing talented people! This year a new record was set when Miguel Lara, a 19 year old Tarahumara runner, crossed the finish line for a time of 6h40m. He was closely followed 4 minutes later by a Czech runner whose name, I’m afraid, escapes me. This is unbelievable. Consider that – in “the normal world” – a good runner would be someone who can run a half marathon, or 21 km, in less than 2 hours. These boys ran faster for four times the distance. 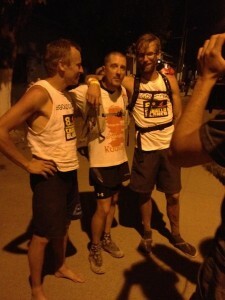 They essentially ran two sub 3.5hr marathons back to back. They are unreal. They even beat former Olympian German Silva who came in a distant third. But for me, the real hero was the guy in sandals, jeans, a shirt, and a cowboy hat. He was probably in his fifties, needed a shave, and looked like any ordinary guy. When I first saw him running, he was about 15 km into the race and I thought, “Never, he’ll never make it. He must not understand how long this race is”. So you can imagine my disbelief when I saw him 9 hours later passing through town with only 15 km to go. I kept an eye out for him… and sure enough, 2 hours later, he ran across the finish line. He was so ordinary looking that nobody noticed him and, after standing at the finish line looking confused for a while, he had to ask a bystander who he should check in with before he could melt back into the crowd to rest. Such strength, such endurance. 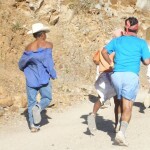 To me this man summed up the Tarahumara runners. He was not running for attention or glory – indeed he seemed embarassed when I went up and congratulated him – he was just running to get the job done and get his corn. 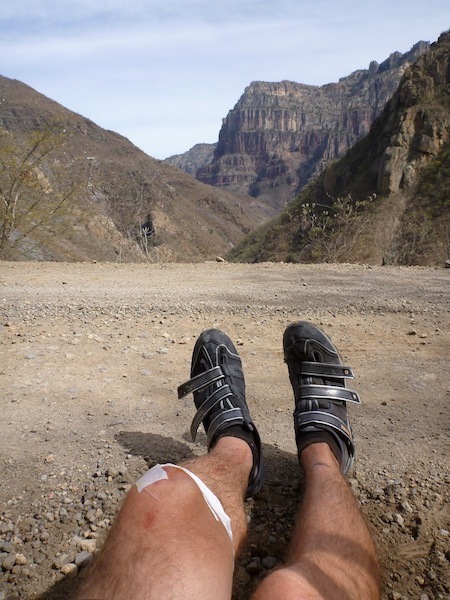 “What doesn’t kill you makes you stronger” (or so the saying goes) and after three weeks in Copper Canyon I crawled away feeling very tough indeed. 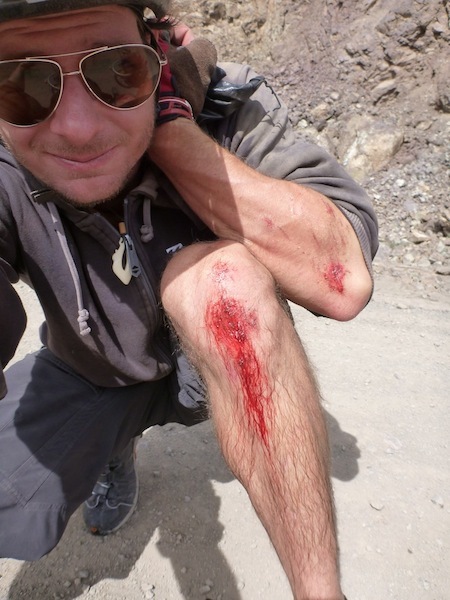 I also felt tired, dusty and half-broken… but that is often the cost of finding inspiration. I say “inspiration”, because that is what I found down there in the labyrinthine canyons of Las Barrancas del Cobre. The Copper Canyon is unique place where the division between extreme and normal becomes blurred and where even two extremes will often meet in the middle. Snow on the canyon rim meets hot sands at the canyon bottom as shady pine trees quickly fade into cacti and rocks. 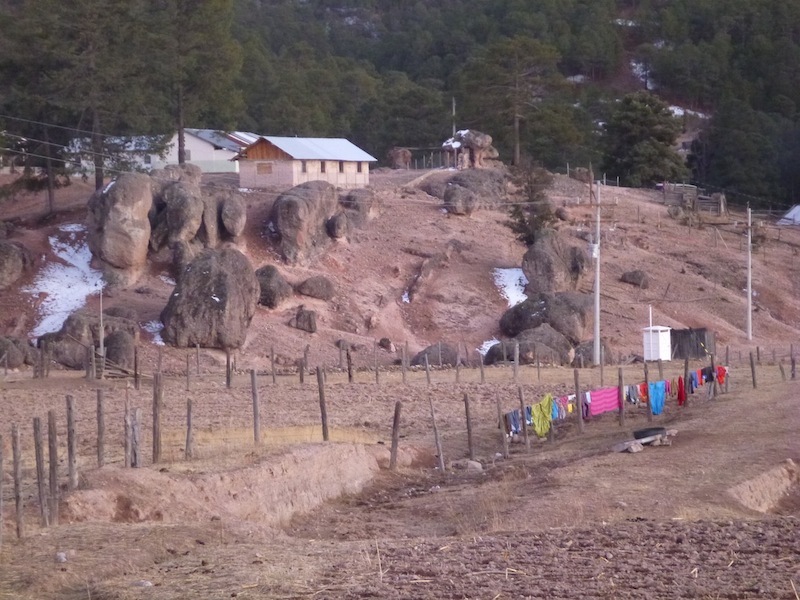 Here you can find Tarahumara walking home while mexican ranchers drive by in their trucks with Santa Maria de Guadalupe smiling back. Marijuana farmers give you weed for free and the Police sell it for cheap. 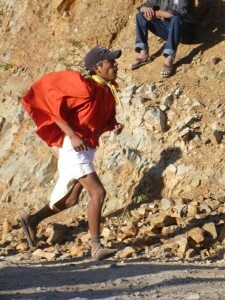 Ultra-runners are extreme athletes, but for the traditional Tarahumara being able to run 80km is normal. And for me? The Barrancas made me realize that two sides of my personality, the desire to live simply and the desire to be extreme, might actually be able to find common ground. 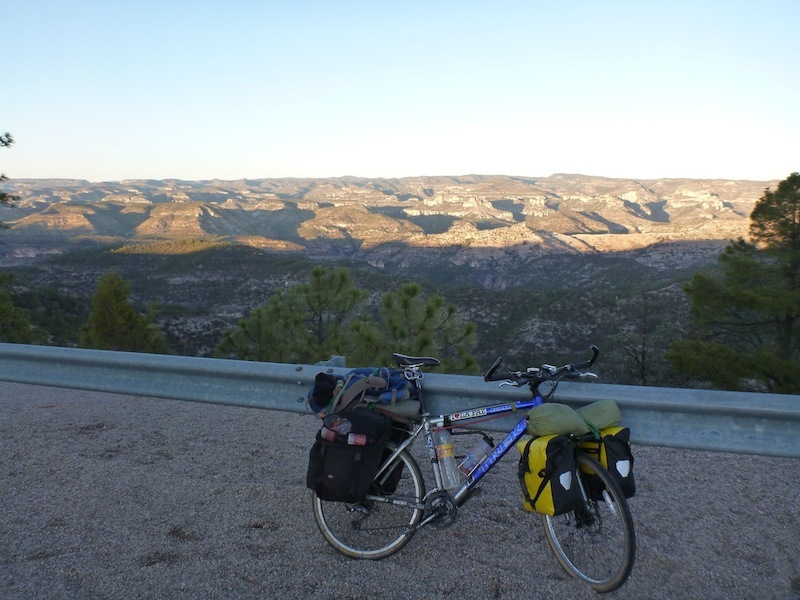 Post Post Script: I’m very sorry to write that just a few weeks after writing this post I received word through the CCUM runners that Caballo Blanco, AKA Micah True had gone missing in the Gila Wilderness in New Mexico. He had gone out for a 12 miles jog and never came back. A huge search effort was quickly organised and many of Caballo’s close friends dropped everything and flew in to help with the search. This included many of the runners I met in Copper Canyon. After 4 days of combing the wilderness, on March 31st, 2012, Caballo’s body was found laying peacefully by a river with his feet in the water and his water bottle lying next to him. There were no obvious signs of trauma. I have been extremely touched by the outpouring of grief from the ultra-running community from all around the world, and can only feel sadness that a man so loved by so many is no longer with us to continue his life’s journey and work. The only solace is that Caballo died doing what he loved. What an amazing experience. 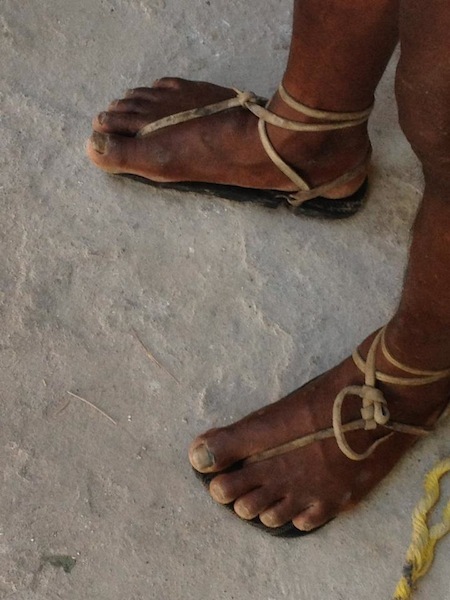 The Tarahumaras or Raramuris (the Tarahumaras like to be called Raramuris which means in their language rara – feet and muri -run) are just amazing. These people are considered by UNESCO as one of the poorest groups in the world. Still, they have a lot of things to show us, they value life in such a different way. This picture looks remarkably similar to your picture (3rd from top). The mesa is the same certainly. Just returned from a 7 day Copper Canyon adventure in my 4Runner. Makes a mockery of the anti – Mexico rhetoric spewing from the Canadian and US governments web sites.